Wabash College invites you to the highly acclaimed theatrical presentation, "James Baldwin: Down from the Mountaintop," on Wednesday, April 13, at 8 p.m. in Salter Hall in the Fine Arts Center. 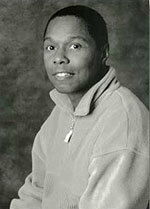 Written and performed by Tony Award nominated Calvin Levels, this monologue focuses on the life of the cherished writer James Baldwin and his activism during the era of the Civil Rights Movement. The play has had a successful theatrical run in Los Angeles, and is currently held in esteem by colleges and universities across the country. Stage manager for the presentation, Carol Barbieri, had this to say, "One of the reasons people connect with this play is because the writing and teachings of James Baldwin are extremely relevant in relation to today’s issues regarding equality, justice and social change." Levels has appeared in 18 films, including the lead role of Wayne Williams in the 1985 mini-series "The Atlanta Child Murders." He was in also in 1991's "Johnny Suede," starring Brad Pitt. His television credits include "In the Heat of the Night, Roc, 21 Jump Street, Miami Vice," and "M*A*S*H."
The presentation is being sponsored by the Wabash College English Department, the C&T Course, the Multi-Cultural Concerns Committee, the Dean of Diversity Fund, and the Malcolm X Institute of Black Studies.